Poachers, Predators and Alien Princesses hunt Bigfoot to the edge of extinction in the quest to discover the Earthman’s true purpose on the alien planet. Self-publishing upstart, Brewhouse Comics, is proud to present: BIGFOOT – SWORD OF THE EARTHMAN, “Poachers of Turonia”, the fourth chapter of the epic six‐issue mini‐series involving the world‐famous sasquatch and his quest to defeat the ruthless emperor of a barbarian planet. Equal parts Conan, Krull and Flash Gordon, the sword, sorcery and sasquatch tale is written by Josh S. Henaman with art by Kubert alums Andy Taylor (line art) and Thomas Bonvillain (colorist). BIGFOOT – SWORD OF THE EARTHMAN is not the story of how Bigfoot became a myth on Earth. It’s the story of how he became a legend of the stars. 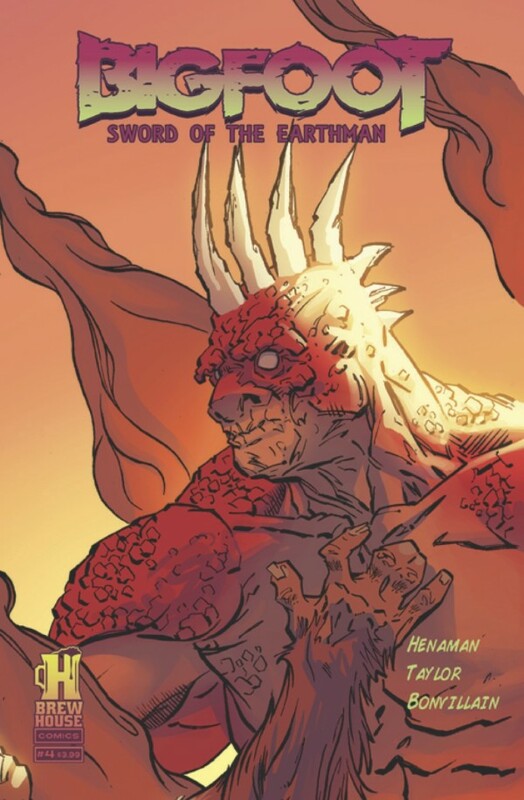 BIGFOOT – SWORD OF THE EARTHMAN #4 will be in select stores and available for online ordering on August 14th, 2013.